I won't include everyone, as I would like to believe that there's someone out there who finishes every project that they begin. But, I think there are many of us that for whatever reason, have garments that languish unfinished, in a drawer, hanging in the closet, or folded up on our work table. They need buttons, maybe a hem, usually just some little something that never seems to get accomplished. While truth be told, I have many, there's one in particular that has almost seemed to cry out, "PA-LEEASE finish me!" If you've followed the blog for a while, you may remember the Pepernoot Sew Along I did on the Sew News blog. 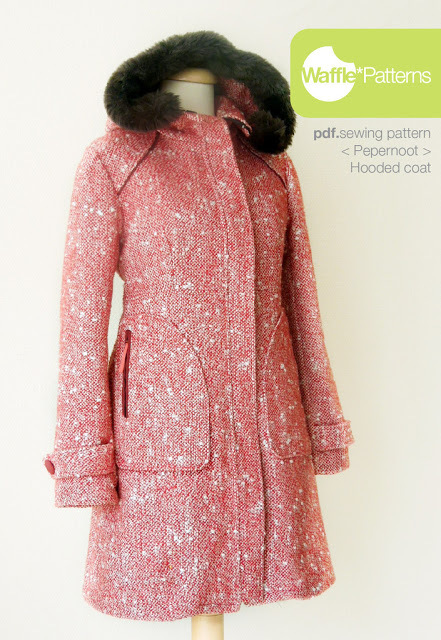 Cute, cute coat from Waffle Patterns. During the sew along, I mentioned that the coat could easily be made without the hood. Some one asked it I would elaborate, so I decided to make up a spring/fall version without the hood. Coat/lining cut and ready to go. The coat was basically finished, I wanted to adjust the tabs. The pockets needed to be added, and the hems finished. The zipper and lining were both in, so just little finishing jobs left. Here, on August 31, 2017, I am very happy to say that the coat is FINALLY finished! I decided to try a different application for the pockets. 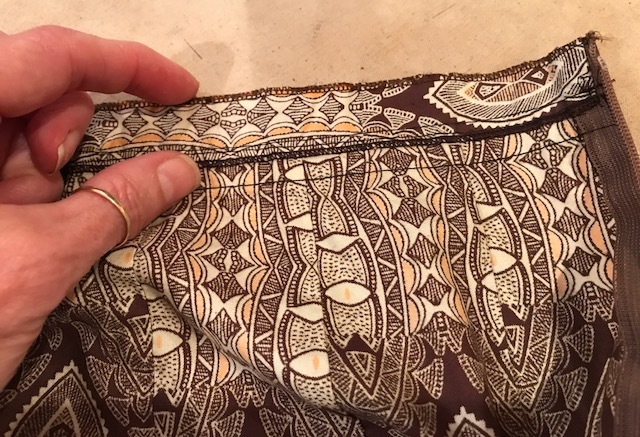 Rather than inserting the zippers, I lined and top stitched around the pockets . Placed them on the jacket and then top stitched them in place. An opening was left to insert the hand. And I made a bar tack at the lower edge of the opening to reinforce the pocket. The hems are in, and I am all set! Finally!!! I recently came across this fun little piece of fabric. Love the whimsical planes, trains, and boats. I'm making a little pencil skirt to wear with my jacket. 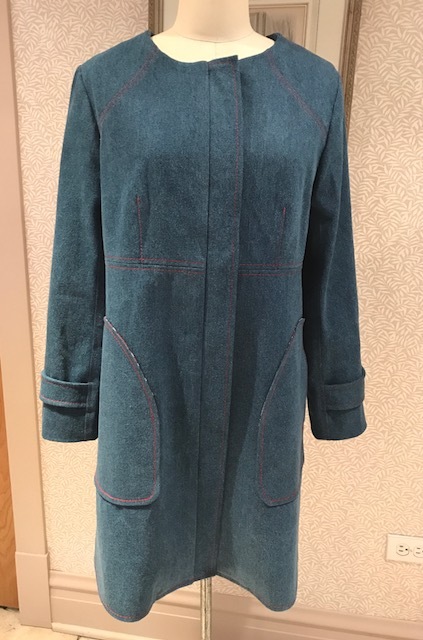 While our languishing projects can't actually cry, we can, like all the times I have gone to get dressed and said, "if only I had that coat finished." Well, now it's finished and I can't wait for the temps to fall just enough to begin pulling it on. Hope I've inspired you to grab an old project and get it done! I received an email from Vogue about the new resort collections for 2018. Sadly, I wasn't overly impressed. Although, a few pieces from the Oscar de la Renta collection did catch my eye. 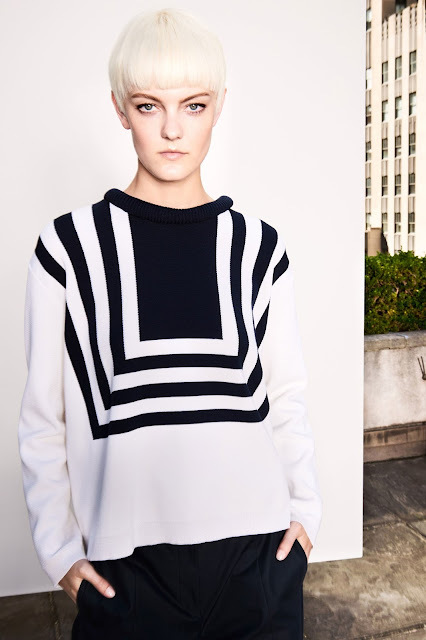 Loved this fun manipulation of stripes with the large piped neckline. I have not jumped on the cold shoulder band wagon. Not that I think it's bad. For some reason, it just hasn't appealed to me...until now. I absolutely love the detail on this open shouldered top. The entire collection is based on a very tropical theme. 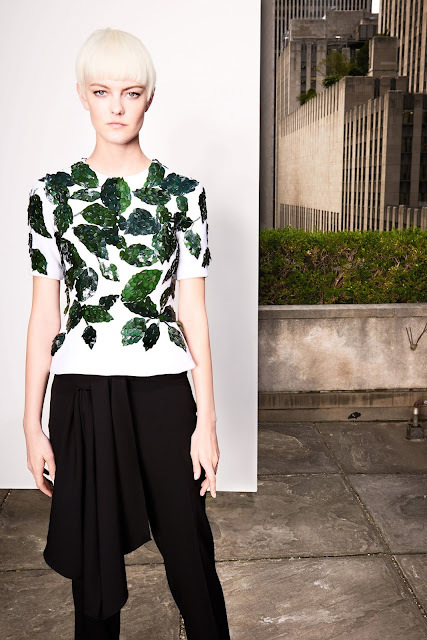 The little leaf top is cute, but it was the pant with the half draped skirt that caught my eye. This I have to do! I think this would be so nice in silk. I included this picture just because I like how they took the palm leaf theme on to the coat. More black and white. I love the lacing detail that runs up the sleeve, over the shoulder and down the side seam of the top. Once again, I included this picture as I love how the palm leaf was used in the dress. I'm sure the fabric was laser cut and then placed on the tulle. What a fun dress that would be to wear! So simple, but I really like the big, bold, beaded cord. Another beaded cord. I like how it was used to hold up the dress, just not a fan of the color. The piece below is from the Reem Acra 2018 resort collection. While the top is not for everyone, I love the flounce. Hope a little something caught your eye! 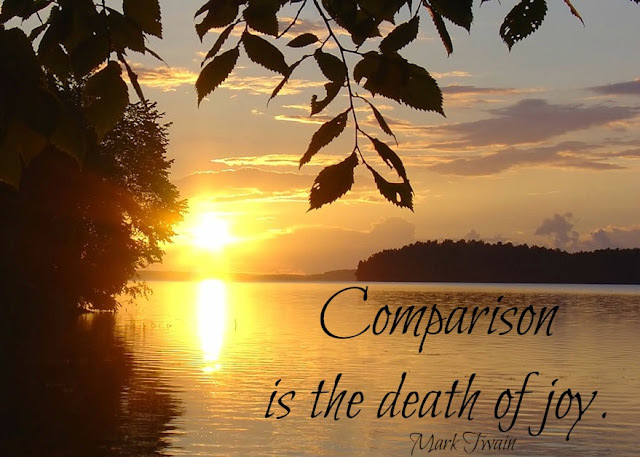 Have a wonderful week. I'm hoping for some interesting revelations during my no television week. Might be interesting!!! One of the exchange organizations that we used when we hosted students began just after World War II. Their hope was that the world would be brought together through exchange students. Since we have hosted students from many countries, my ears always perk up whenever I hear of a disaster in a country in which they live. But today, my eyes are upon Texas. The area that is being hit so badly is where I am from. I have friends there who are struggling. It breaks my heart, and I wish I could do more than pray. Hopefully the worst is over. First, begin with the sauce. Saute a large chopped onion, red bell pepper and garlic until translucent and tender. Once the vegetables are tender, add a 28oz. can of fire-roasted diced tomatoes, crushed red pepper to taste, and a 1/2 cup of nice chardonnay. Bring to a boil and allow the wine to reduce for approximately 15 minutes. Reduce heat and simmer for about another 20 minutes. Puree with a hand held mixer, or place into a blender to puree. Return to pot to keep warm. Sprinkle the chicken breasts with salt, black pepper, and garlic powder. Drizzle a little olive oil over the breasts. Place on the grill and cook on each side until cooked through, approximately 3-5 minutes per side. Turn off the fire on the grill if you have a gas grill. If not, remove breasts to a plate. Top with pesto. If you have removed the breasts to a plate, cover with foil to keep warm. Cook quinoa according to package directions. I just happened to have black quinoa. Place a layer of quinoa on each plate. Top the quinoa with the sauce. Add a layer of spinach on top of the sauce. I like to use frozen spinach that I have cooked in the microwave. It's easy and takes no time at all to prepare. If you are vegetarian, top the spinach with some pesto and roasted pine nuts. For the non-vegetarian, top it off with the grilled pesto chicken. Super easy, and super good! Heat oil in pan. Add onion and saute until translucent. Add chopped red pepper. Saute until tender. Add garlic and saute an additional minute. Add tomatoes, wine, herbs de Provence, crushed red pepper, salt and black pepper. Bring to a boil. Reduce heat slightly and allow wine to reduce for approximately 15 minutes. Reduce heat to simmer and cook an additional 20 minutes. Using a hand held mixer or blender, puree sauce. Return to pot to keep warm. Purchase desired number of chicken breasts to serve. Sprinkle salt, black pepper, and garlic powder over chicken breasts. Drizzle with a little olive oil. Place on grill and cook for 3-4 minutes on each side or until cooked through. Remove from heat and top with pesto. Meanwhile, cook quinoa according to package directions. Amount will depend upon how many you will be serving. Use package directions to determine serving size. Cook a 10 oz bag of frozen spinach in a microwave safe covered dish for 3 minutes. Stir. Return to microwave and cook an additional 4 minutes. Place a layer of quinoa on each plate. Add a layer of the sauce. 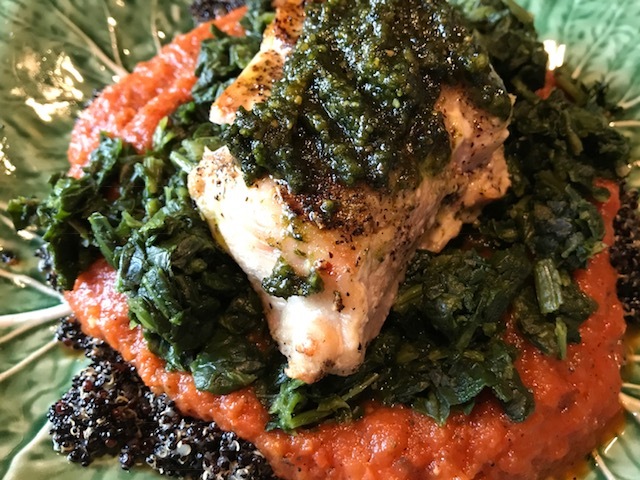 Top the sauce with spinach. *For a vegetarian dish, top the spinach with pesto, and roasted pine nuts. *For a non-vegetarian version, top the spinach with the pesto topped chicken. This dish is not only great for a weekday dinner, guests would love it too! During my husband's career, he had a secretary that took care of, as it turns out, a lot. On his very first Monday of retirement, he told me that he would like to schedule an appointment to see his doctor. I quickly realized that he didn't intend to make the appointment, but wanted me to. So, I made the call and then wrote down the appointment time on a piece of paper, at the top of the page. I wish I could act what he then did. I actually sat there in amazement. He put his hands up, palms facing me as though he he was going to stop me, and then said, "Okay, as you go about scheduling my day, I would like for you to put my first appointment at the bottom of the page and then work up from there. Then, as I go about my day, I can just tear off each task as I accomplish it." As I was sitting there listening to him, my first thought was, "as I schedule your day???" But, I listened, and when he finished, I took a deep breath and said,"Oookay," lips somewhat pursed ;) That was the last appointment I made for him. He has learned to take care of himself, with 1 exception, I find books for him to read. I was actually going to tell you last night's skunk story, another day :) Gracie did not get sprayed...Thank God!!! 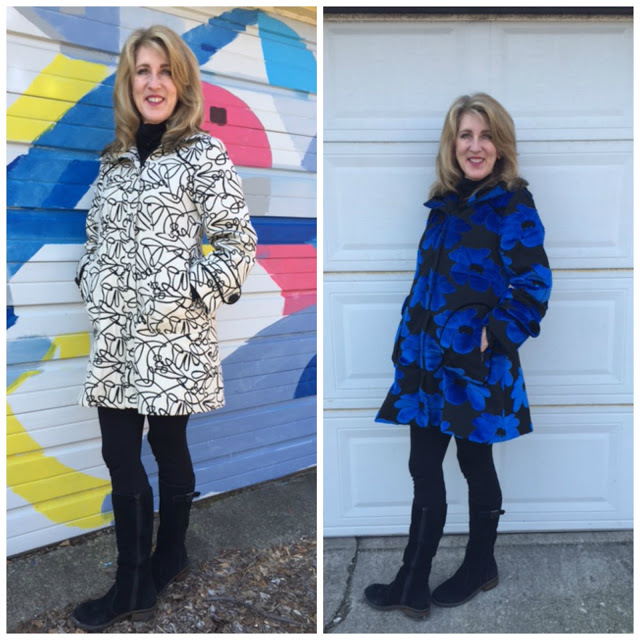 Last week I did a rather unconventional Wednesday Showcase post, sharing a bit of my closet, and introducing you to Jennifer Scott of the Daily Connoisseur. This week, I thought I would share 2 blogs that I think you might enjoy, not traditional, but interesting nonetheless. I'm sure most of you know about Canada College in Redwood City, California, near San Francisco. They have a fabulous fashion design and merchandising department and offer class times that will fit into most schedules. Each year, the school sponsors a wonderful event, Artistry in Fashion. You can read more about it HERE. If you follow Communing With Fabric, then you know about the event as I think she tries to never miss it! The fashion department also hosts a wonderful blog which you can find HERE. There you can read about fashion trends, spotting new trends, and designer showcases like this article on Michelle Paganini. There's even an article on how to overcome a creative block. Truly, something for everyone who loves fashion and design! 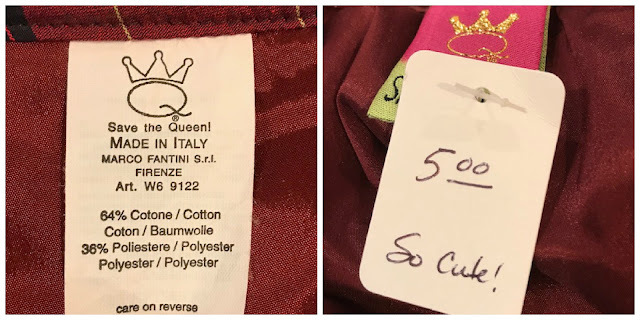 Next up is a brand new blog from Couture Fabrics. They just began blogging in April of this year. The articles are short, but offer information on fitting, working with menswear fabrics, and working with fine fabrics. And of course, they even showcase some of their exquisite fabrics. I popped over to my YouTube channel to see if any messages had been left, and low and behold!! 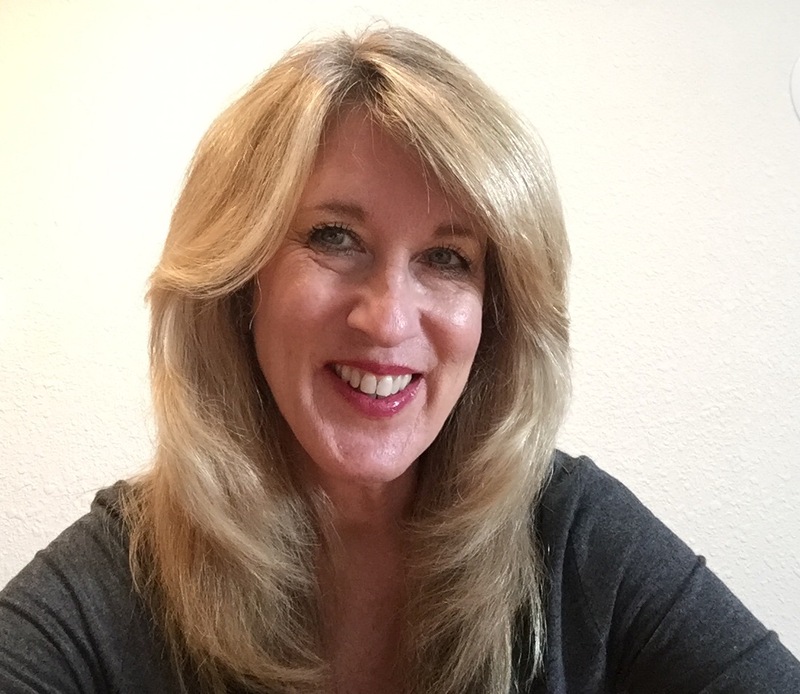 !, there was a message from Jennifer Scott, the author of the Madame Chic series of books, and the Daily Connoisseur blog. I could not believe my eyes! Someone had left her a message about the video I did last week, so she decided to check it out. She left the most gracious message. What a lovely treat for me :) If by chance you missed the video I did, you can find it HERE. 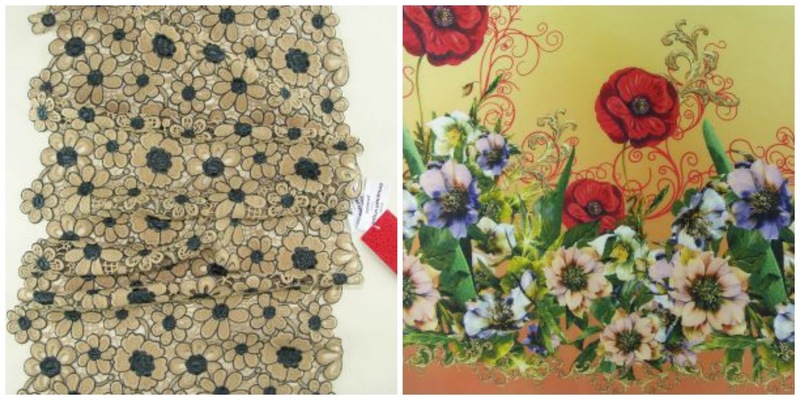 I recently visited a resale shop and found 2 wonderful pieces. Each had something rather interesting about them that I thought you too might enjoy seeing. This skirt is a 16 gore skirt. The principles of making this skirt are exactly the same as the basic 8-gore skirt, just divide by 16 rather than 8. Rather, the construction of the waistband, or at least what works as a waistband. The gores of the skirt were sewn together, in this case, serged together. 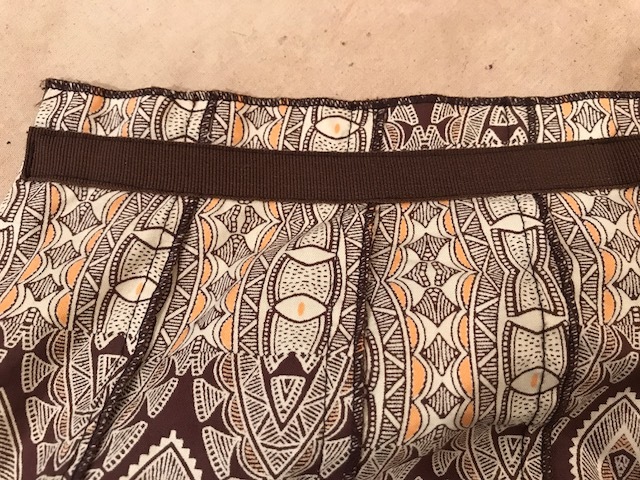 Rather than adding a typical waistband, a 1" strip of fabric that was cut on the straight of grain was serged to the top of the skirt and stitched down. 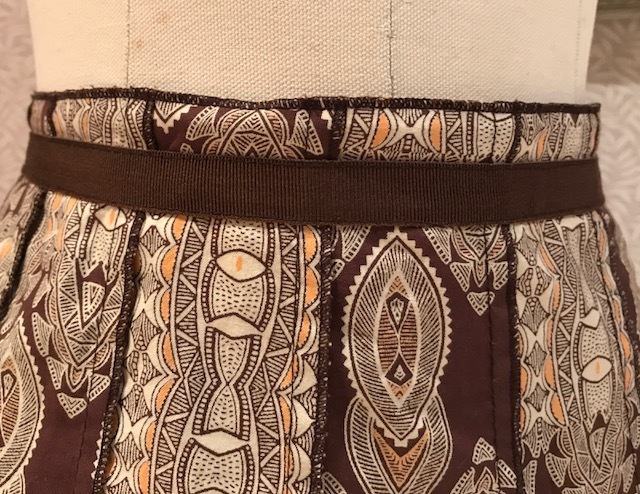 On the outside, a strip of grosgrain ribbon (typical grosgrain ribbon, not petersham ribbon) was stitched over the stitching line of the strip that had been sewn to the inside of the skirt. It's such a simple application, but I think it makes for an interesting way to finish a waistline and add a little interest. I paid a whopping $3.00 for the skirt. The second piece I purchased is just so much fun. This skirt is more of a design inspiration piece. 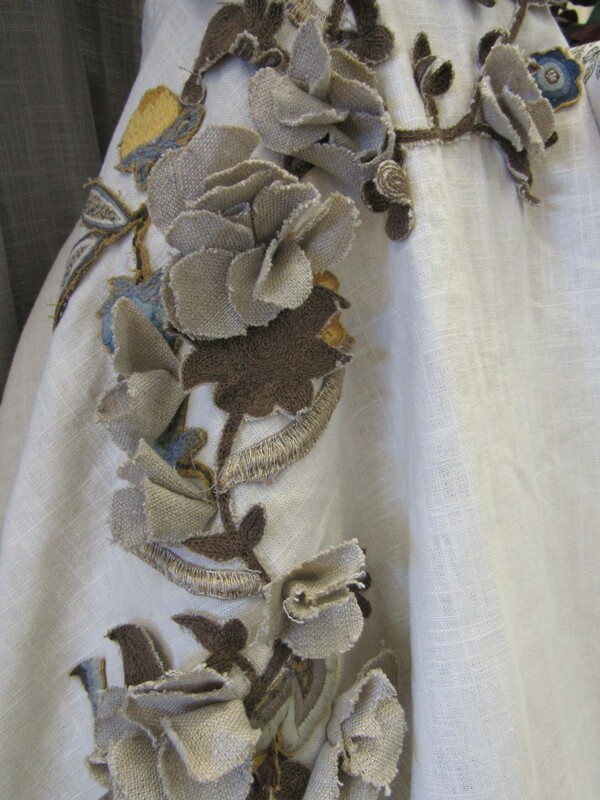 Velvet and taffeta were used to make the skirt, but wonderful hand painted touches were added. The 2 strips of velvet ribbon were both painted and then stitched to the front of the skirt. 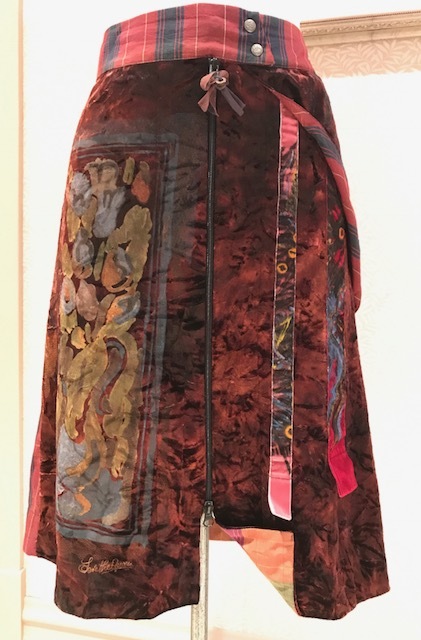 On the right side of the skirt, a painted panel was done on the velvet. The waistband was made from a piece of plaid taffeta and accented with the panel on the side. The added panel is just an accent piece as there were no pockets added. The back has a velvet yoke sewn to the taffeta that has also been painted. Love the addition of the ring that hangs from the yoke seam. 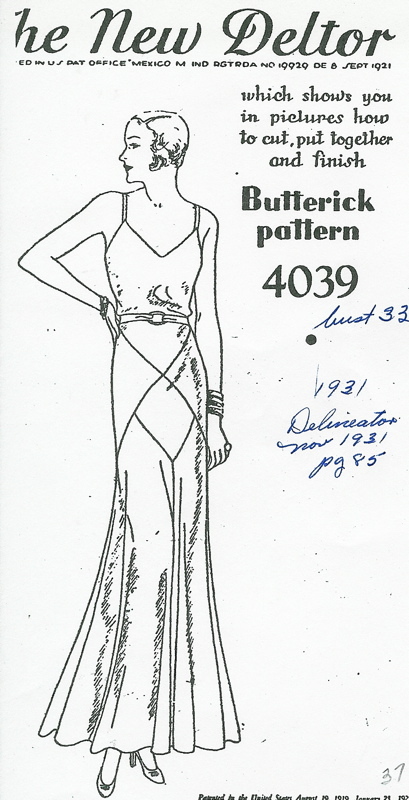 A second piece of taffeta was used to face the hem and the center front zipper opening. This past Sunday, my husband took me to the teeny tiny town of Creston, IL to do a little antique shopping. I only found 2 items, but I thought they were both quite special. Both pieces were painted and embroidered on silk with the original protective paper still in tact. I initially thought of the painted skirt above and thought that it might be fun to do something similar with 1 of the pieces, but I'm vacillating. They are so very beautiful, so I may just have them framed and enjoy the art aspect of each piece. Hope my resale shop pieces gave you a little inspiration! Two weeks ago, I found out that the yoga studio in my neighborhood offers a weekly restorative yoga class. The first week, I had an excruciating headache. I hate when I get these headaches. They last for 48 hours, regardless of what I do, or what I take to relieve the pain. I went anyway, and I was so glad that I did. The headache did not go away, but an hour and 15 minutes of relaxation poses was just what I needed. I'm now hooked. Tonight will be my third class, and I cannot wait! My husband belongs to the Model A Ford Club of America. The club is composed of men and women who love Model A Fords, and enjoy the era in which the cars were produced, whether they own one or not. They even produce a magazine that comes out every other month. There's always a fashion related article in every magazine. The articles encompass everything from accessories, to tips on how to select the best dress suited to your body type. And even better, access to the articles is FREE!!! You can see an entire list of the articles HERE. Scroll to the bottom of the page and you'll find a link to access archived articles. The organization has worked hard to bring their members resources for authentic clothing. HERE you will find their Pattern Project page. 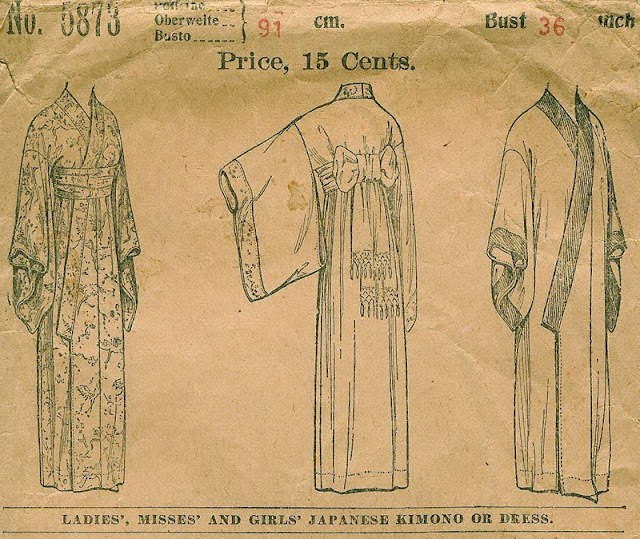 And even a pattern for a traditional kimono. 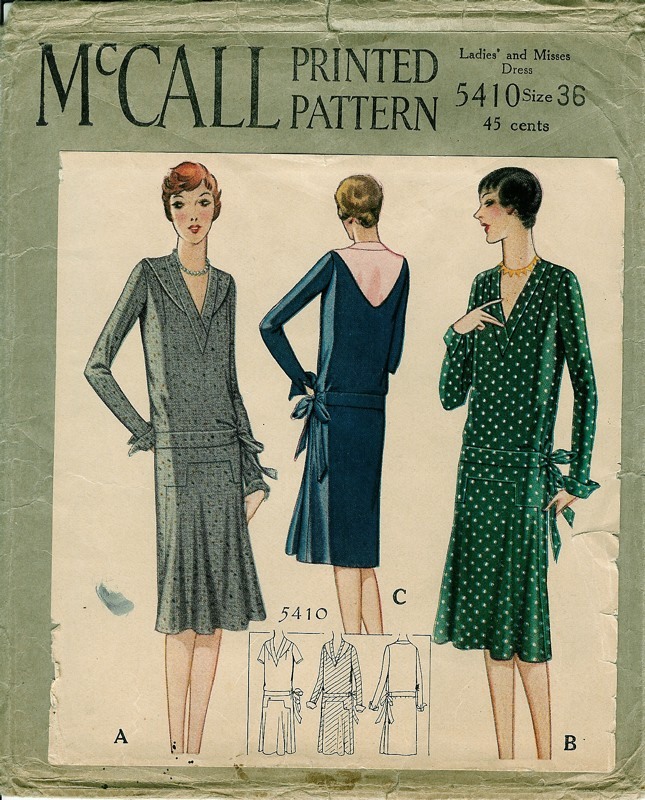 Info on other patterns and how to order can be found HERE. 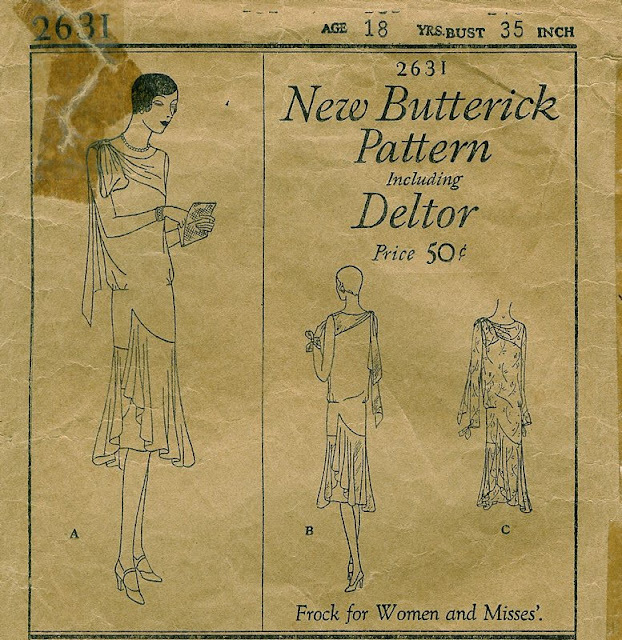 I think this is a wonderful resource for anyone who enjoys vintage fashion. So many of the fashions are really quite timeless. 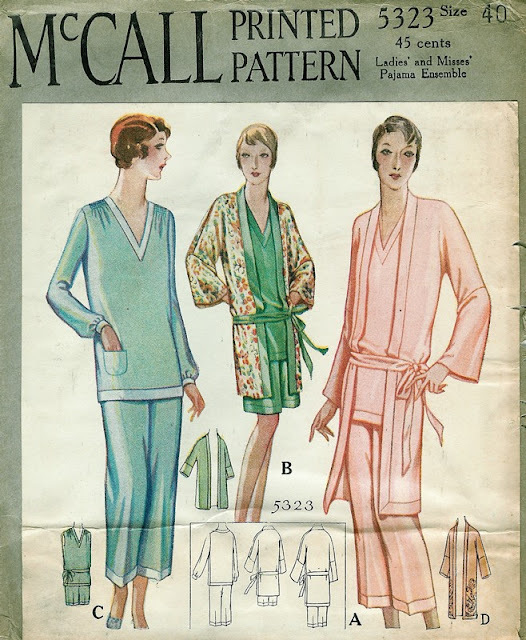 Most of you know about the wonderful Decades of Style pattern company. There you can find lots of wonderful vintage patterns that can easily be translated into pieces that work for today. 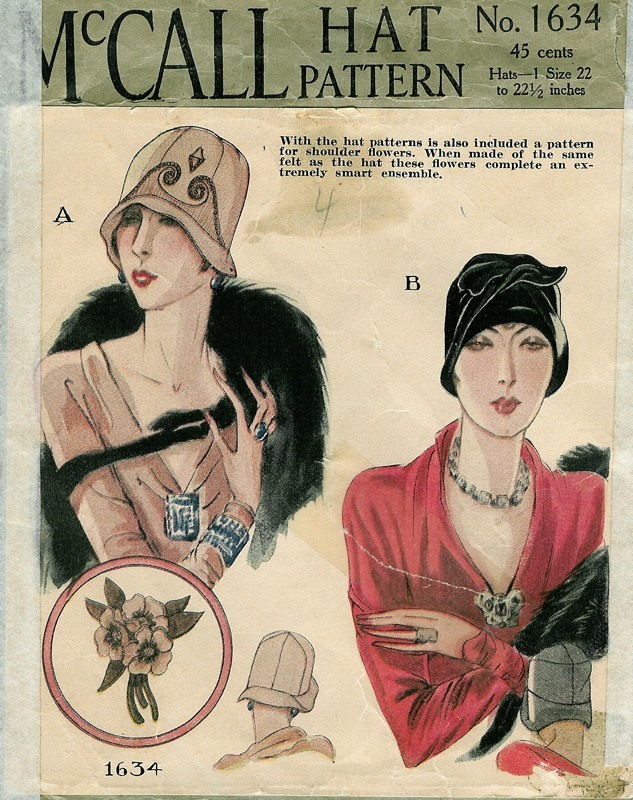 You can find their 1920's patterns HERE. The Call of the Red Suede Wild! Details Can Really Make a Garment Pop!